Delta Aggregates supplies locally sourced aggregate for residential, commercial, and highway construction projects. Delta also provides road base preparation and site maintenance services, as well as landscaping products and installations. Delta Aggregates is located in Swift Current, Saskatchewan. 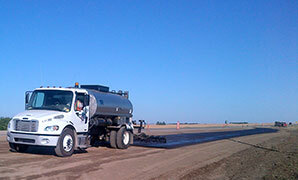 G&C Asphalt provides asphalt paving, preparation, and maintenance services in the North Battleford area. G&C&apos;s services include construction, preparation, and maintenance for roads and industrial sites. Located in Estevan, Saskatchewan, Souris Valley Paving provides asphalt paving services for commercial and municipal projects. From base preparation to maintenance, Souris Valley covers every step of your paving projects with precision and consistent quality. G&C Ready Mix provides ready mix concrete and concrete pump services in North Battleford, Saskatchewan. G&C Ready Mix carries a wide selection of speciality concretes and concrete products suitable for a variety of purposes and finishes. Westland Concrete, a division of Delta Aggregates, provides concrete and concrete products to customers in Swift Current, Shaunavon, and surrounding Saskatchewan communities. Westland is dedicated to providing their customers with high quality products, exceptional service, and thorough knowledge of concrete care and standards. The Town of Battleford and Sask Highways tendered a twinning project from highway 16 along highway 4 through Battleford. G&C was proud to be awarded and completed the multimillion dollar project over the course of two years. It is now a flowing corridor for truck movement and an efficient roadway through the Town.